GP2TheMAX - Helping users get the 'MAX' from Dynamics GP: Need to upgrade your Excel skills? Not sure where to start? Need to upgrade your Excel skills? Not sure where to start? 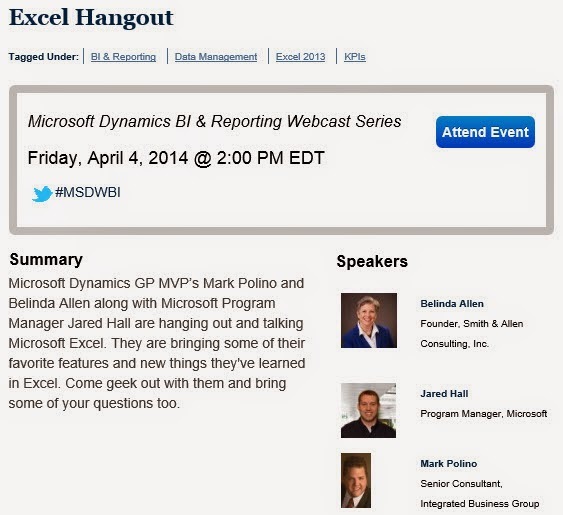 How about starting with a free seminar co-hosted by Mark Polino, and Belinda Allen, GP MVPs and Jared Hall of Microsoft? Click on the image above to register for the event.